When the post-election violence broke out in 2007, Jane Njeri was just five years old. Frenzied youth on the rampage protesting the election outcome finally got to their home in Mai Mahiu on the southern end of Nakuru County, and turned her family’s haven into hell on earth. Her father was murdered as she watched helplessly. Until then, everything had worked just fine and the family lived a happy life. The downward spiral was fast and hard. The family, together with others relocated to the Mai Mahiu IDP camp where they live in houses built for IDPs by the government through the resettlement programmes. But the debilitating effects of the 2007 post-election attack still reverberate. Life then became a blur, with little hope of ever making a break. In 2016, Njeri got a full scholarship at Njabini Girls Secondary School, shining a light of hope. Njeri’s talent has grown and she stood out during the Central Region Chapa Dimba Na Safaricom semifinals staged at the Thika Technical Training Institute on Saturday 3rd March. Good Girls lost narrowly to Limuru Starlets and this means that they will not proceed to the National Finals set for March 24th at the Bukhungu Stadium in Kakamega; an opportunity that Njeri was really looking forward to. “Football is my only hope out of poverty and I was really hoping to play in the finals, impress and hopefully get scouted,” she said. The Chapa Dimba Na Safaricom Football Tournament aims to recruit young talent aged 16 -20 to play in a national tournament, showcase their talent and stand a chance to earn from their passion. 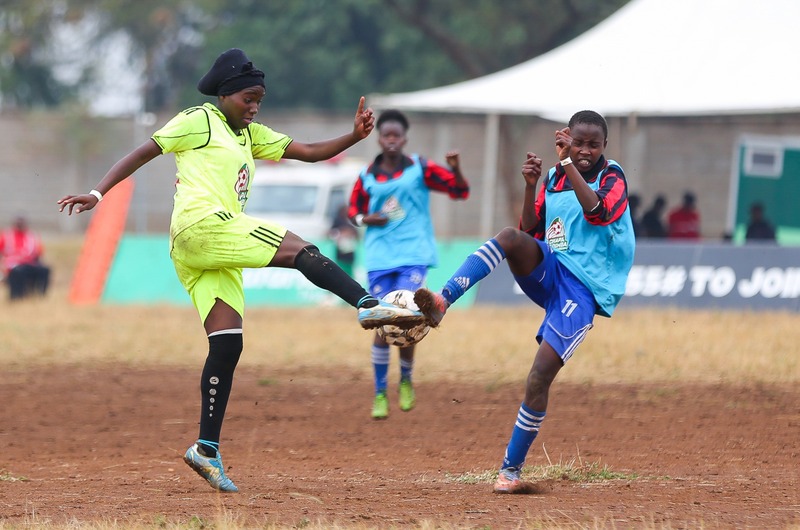 Jane Njeri (right) vies for the ball during the Central Region Chapa Dimba Na Safaricom semifinals staged at the Thika Technical Training Institute on March 3. “I have a crop of very talented girls in the team and I took some of them for the U17 and U23 Harambee Starlets trials but they never made it. The selectors said they looked weak and small in body size. That really broke my heart because I know they are really talented,” Gullit said. Both Emman and Njeri have not given up. They are hopeful that she will get her lucky break and be called up to the national team and hopefully land an international deal. “Top coaches in this country focus on winning and they forget about developing players at the grassroots level. We cannot achieve sustainable success without nurturing talent. Tournaments such as the Chapa Dimba na Safaricom are really important and my plea is to ensure we have more of such,” he added. Coach Gullit says he will continue focusing on developing the girls and hopefully impact their lives positively. “We have had very many challenges for us to get to this level. Most of these girls are from very poor backgrounds and they were hoping to win the central region finals to at least get some money to buy kits ahead of the national finals. I was also hoping to buy balls and other equipment but it wasn’t our time. We will give it a try next time.” He said. Njeri still looks forward to changing her family’s fortunes through football. “I am the third born in a family of four and I really empathise with my mum. We have stayed in the IDP camp for so long. My dream is to move my family out of the camp and start a business for my mum. I will work harder and hopefully sign for a good team in the near future. Dreams do come true and I will not give up,” a teary Njeri said.